Everyone has heard of tostadas, but this Tex Mex recipe is usually made with ground beef or shredded cooked beef. Our version is made with chicken; chicken nuggets, to be exact, for a very simple recipe that is quick to make and delicious. Sometimes we use fake chicken nuggets in this recipe. They are made from soy and are surprisingly good. In fact, we have served the faux nuggets to people who really thought they were chicken! You can use those or regular chicken nuggets in this easy recipe. We recently found some refried beans that we think are fabulous. They are dehydrated, so you cook them in boiling water until they are thick and smooth. They have much more flavor than the canned variety and we highly recommend them. You can buy them on Amazon.com. They also come in a fat-free version. And the tostada shells come from Amazon.com too. We have made this recipe for years, but we always had to fry corn or flour tortillas and fry them ourselves, which is not an enjoyable process. So we discovered you can buy tostada shells that are premade; just take them out of the package and load them up with the toppings. Top these wonderful tostadas with anything you'd like. The avocados we bought for this recipe when we took the picture were not good looking, so we just left them out. You could use avocados, guacamole, pickled jalapenos, chopped tomatoes, salsa, sour cream, taco sauce, or any other topping in the Tex Mex genre. Serve these tostadas with lots of napkins, because they are messy to eat, and a cold beer or some iced tea. Prepare the chicken nuggets as directed on the package. Then open up the can of refried beans and heat them in a skillet on the stovetop. Or, if you bought the dehydrated beans, prepare them according to package directions. When the nuggets are cooked to 165 F and the refried beans are hot, assemble the rest of the ingredients. Make the tostadas by placing a tostada shell on a plate. Spread with some of the refried beans and top with the hot chicken nuggets. Then top with the shredded cheese, which will melt on the hot chicken. Then add any of the other toppings that you want. In fact, let each diner select his or her own toppings and let everyone make their own. 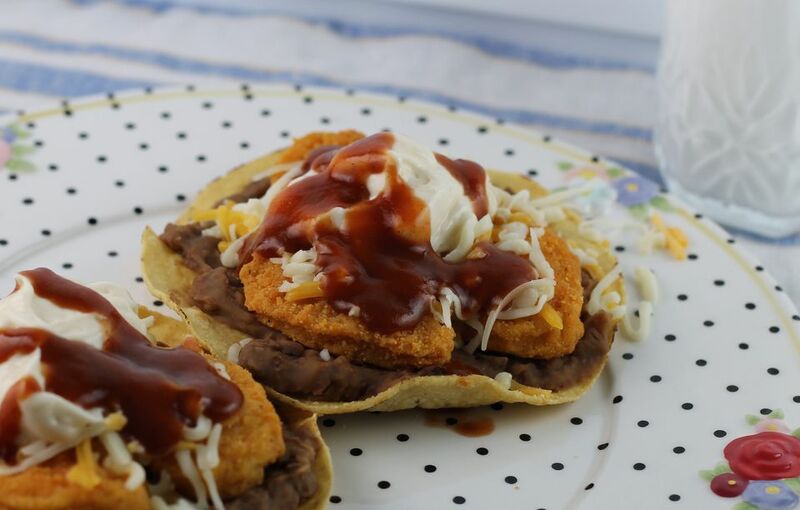 Enjoy every bite of these delicious tostadas.